moza1que is a permanent artwork for 'La Maison Mécatronique' in Annecy-Le-Vieux, France. The main wall of the entrance hall 3.4m x 6m is divided in 26x15 squares. Each of the 390 tiles is motorised by a linear actuator with a range of 10cm. The individual control of the motion creates different three-dimensional reliefs of geometric patterns evolving following the logics of cellular automata. 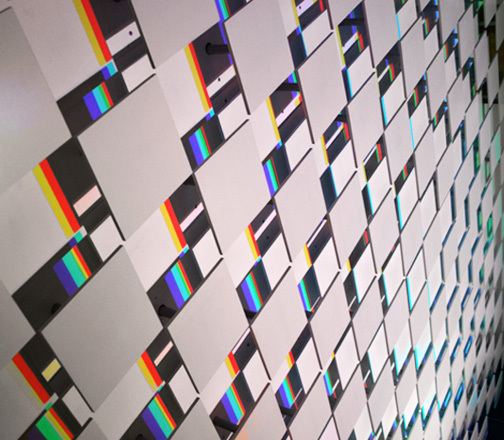 During day these programmed motifs draw black shadows whereas in the evening they draw coloured shadows: The illumination by three light-projectors in primary colours of red, green, and blue leads to a global white illumination of the wall but the tiles' shadows appear in the secondary colours of light. These coloured surfaces appear and disappear according to the tiles' movement. The artwork relates motion with colour through the phenomena of light; while it's mechanic and electronic system is exemplary for the very function of the building.